I am well and truly in the 'nesting phase' of my pregnancy. I've been doing all kinds of ridiculous things, like ironing (what?! ), dusting, sorting and most recently, crafting. 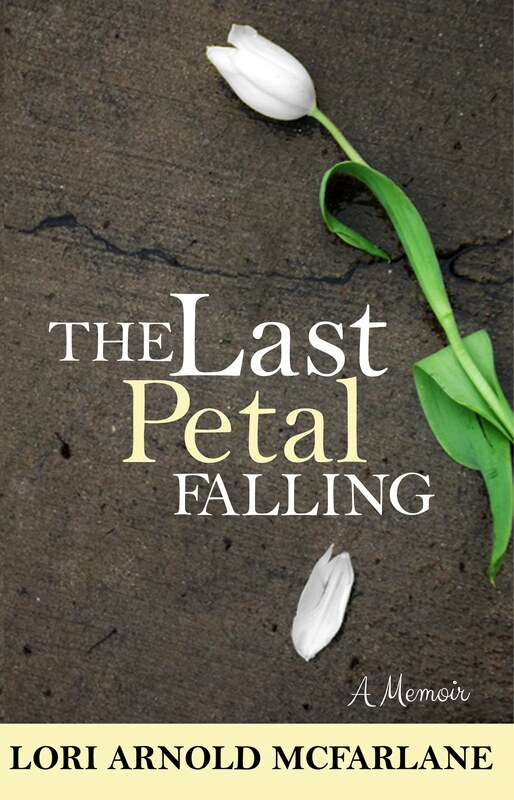 I have a few projects I want to complete, and I am starting to actually get around to them. 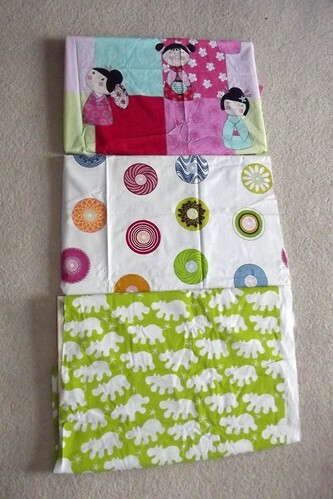 One thing I've been meaning to do is cover some bulletin/cork boards with fabric for the kids' room. I found this tutorial online and last night I finally got around to doing it. 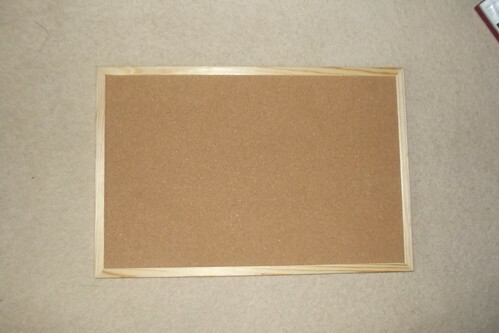 I had three boards, one for each child, to put their special achievements and artwork on. They started out as simple boards from Tesco. 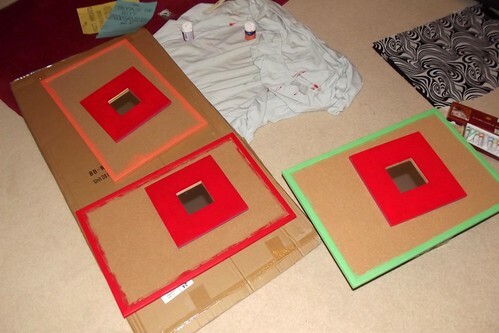 Then I painted the frames in the colours that I will be trying to limit their room to. As for the fabric, I was torn as to which way to go. I could either keep their room in the black and white with some red and orange (and now some green for baby boy), or go all colourful. 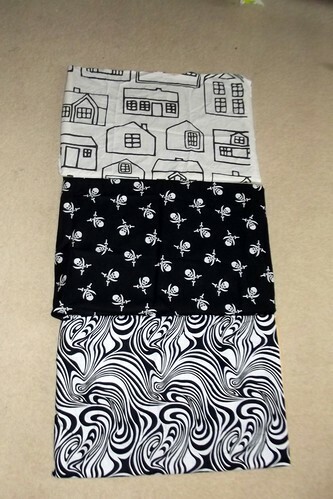 It was a tough decision, especially after Fifi said she only liked the colourful ones and was not going to like the black and white. Well, Fifi lost. 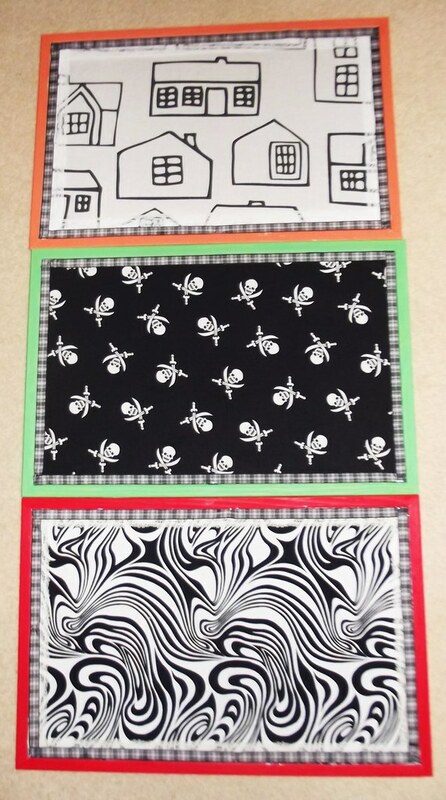 They already have a black and white zebra bedspread (with green sheets) and a black toy cupboard, and their bed frame is black. The bunk bed has a solid red tent over it and a red and orange bedspread, and there are several red photo frames already in the room. And the curtains I've picked out to replace their pink ones are red. So I decided to stick with the black and white theme with the tri-colour accents. 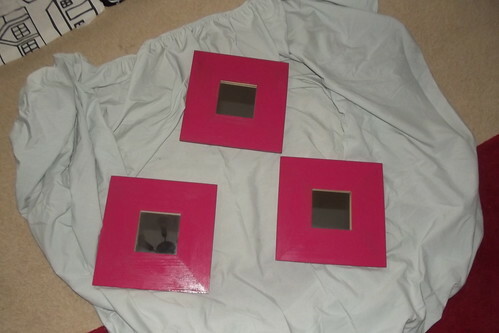 So I dressed the frames with the fabric and tried to cut the fabric with a rotary cutter I have had for years and never used. There is a reason a klutz like me should not use rotary cutters. I sliced my finger open on it. Luckily I didn't bleed all over the fabric... although the red would've matched! I also made a huge mess of the edges. The tutorial suggests ribbon trimming, but I hadn't intended to bother; now I had no choice. 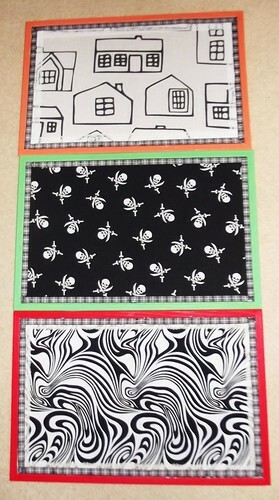 I scoured the house looking for strips of ribbon long enough to frame the boards, and all I found were lace - fine for the girls but not the boy - and some black and white tartan. So I ended up trimming the boards after all. The old-fashioned lace was a bit funny looking on top of the modern prints, so I double lined them with the tartan on top of the lace and somehow the odd mix of modern fabric, old yellowed lace and tartan ribbon ended up working. Thank goodness I went with the black and white look! Furthermore, while I had the paints out last night, I decided to get a few other minor projects sorted. 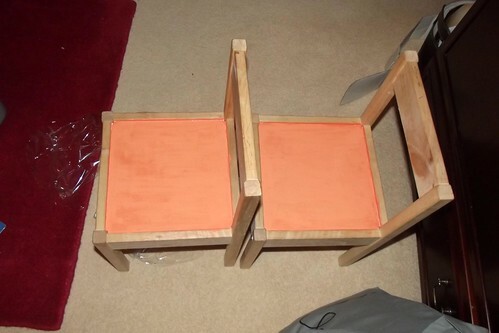 I had painted the kids' IKEA chairs orange about a year ago, but they had by this time been scuffed, scraped and drawn all over with an ink pen. So I repainted the chairs. 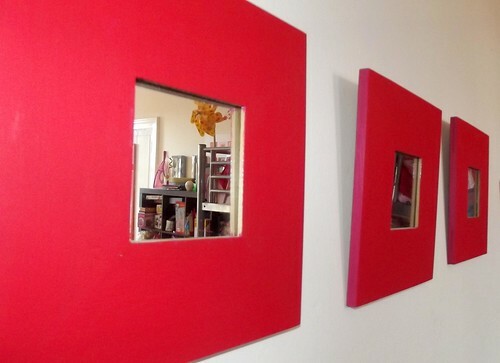 I had also painted some IKEA mirrors pink back when Fifi was a baby to match her then pink and green bedroom. Since I'm trying to de-girlify the room to make space for our little man, I repainted these as well. All in all, a very productive night, considering I also ironed all of Scott's shirts for the week (by gum, I even used the spray starch! ), folded and put away two loads of laundry, cleaned and hoovered the living room and baked a chocolate cake. The only thing I didn't get around to was that last load of laundry hanging on the pulley and putting new glass in a broken frame. I will do those tonight... I might even repaint the frame before putting new glass in it! Yes, I think I will do that.